There may be too many Minis. There, I've said it. This is the sixth. But if we must have another, why not a tiny two-seater convertible? It's cold comfort (until you turn on the heater) but at least the new Mini Roadster is heading in the right direction, size-wise, getting ever-so-slightly smaller than the Mini Convertible. 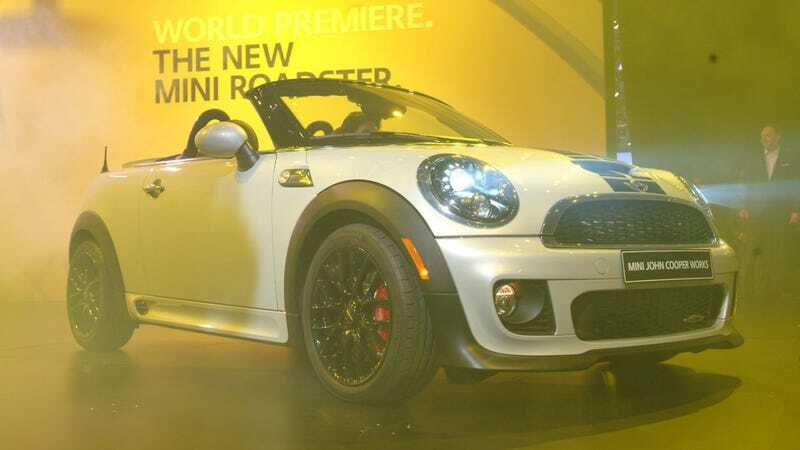 As the sister car to the hard-top Mini Coupe—the ugly one — the Mini Roadster isn't shorter than the 2+2 Mini Convertible, but it is just under an inch more low-slung—and it is blessedly lighter, even with an electric rear spoiler that pops up to add downforce over 50 MPH. Engine options are what you'd expect from the Mini lineup, with a 121 HP 1.6-liter inline-four at the base or an S model with a turbocharger good for another 60 horses. (A top-end John Cooper Works package will be even wangier.) Six-speeds are standard with automatic transmissions for those who plan to fill the other seat with chips and salsa. The same "Openometer" from the Convertible is in the Roadster, as well; like stretch marks on a stripper, it measures how long the car has been operated with the top down. I may think there are too many Minis, but I'm apparently alone: Mini had their best sales year ever last year, certainly in large part to their ever-broadening fleet of nearly identical vehicles.